So, today while playing PUBG mobile I landed in a secret building in Los Leones. Los Leones is located in the Miramar map. It is quite possibly one of the most populated areas of this map, as there is currently several challenges involving this area. What is very odd about this particular building is the fact that there is no way out. My squad tried everything to get me out, even throwing various frag grenades relentlessly at the building in efforts to blow it up. A smoke grenade was able to find its way under the cracks of the walls, but I was pretty much stuck in this particular building or room for the entire match. Obviously I was unable to kill anyone and be killed by anyone, so I ended up dying in the play zone area of the game, outside of the circle. I was the third player to die, as Nukuler ended up being the last surviving member of the team. This secret building or room is very interesting to me because I could not find a way to escape. Has this ever happened to anyone? If so, I would love to hear your story regarding this. I would also love to know how to get out of this. Is this just a game glitch? I think from now on, I will just avoid jumping here and stick to my regular strategy of jumping where no one else lands. Do you play PUBG Mobile? Are you looking for an incredible clan to join filled with teamwork and a memory breeding mobile game experience? If so, definitely join our clan the Angra Mainyu Clan. Created by Billy Housh (who is the primary leader of the clan), I am co-leader of the clan. Recently, he created a video for the clan on his official YouTube channel. You can watch the video above. If you cannot see it, simply click here right now. The video shows live stream footage of us playing on the map Sanhok. The music is "Warriors" by me (originally by Imagine Dragons) which was chosen by Billy personally for this video montage he created. If you are playing PUBG at the present time and looking for a team to join, definitely check out the Angra Mainyu Clan. the PUBG duo match I just played. I am starting to really love and appreciate PUBG Mobile. Not only is it engaging, but I feel like I am getting a life lesson in navigation, which is essential when playing any kind of strategic action game. I would say this is my best game; however, due to lack of kills, it is not. I still really enjoy PUBG. I decided to get on my phone and play with my friend Billy Housh in a duo match. And for those of you who do not know, Billy and I have been friends for over 10 years. He is known for his comedic videos on YouTube as well as his live streams (mainly gaming) via Twitch. The duo match was held in the Erangel map where we both played the game via Classic TPP (Third-Person mode). We decided to play the Asia server, which had a relatively high ping number (and for those of you who are unaware, this equals extreme lag) but was fun nevertheless. For not killing anyone, I still managed to receive 1,234 BP. I also gained 551 in experience. My total rating was +55, with most of the points being from survival where I garnered +53 points. I received a +7 kill rating for not killing anyone. I think that is excellent for not killing anyone. 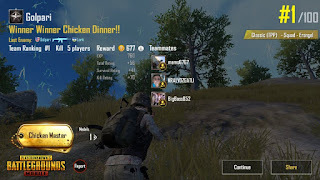 The final player (LucTienSinh from China) ended up dying in the actual kill zone (out of the circle) so we ended up winning the famous chicken dinner at the end of the game, making us the winners of this particular match. If I had to choose a favorite mobile app right now, it would definitely be the PlayerUnknown's Battlegrounds (also known as PUBG). This game is literally one of the most adventurous, digital escapisms I have ever experienced. As strategic as it is, this fascinating game is about survival, kills, damage, supplies and support. Each one is as unique as the player who embraces them and together will determine your overall rating of each play. Completing missions is also quite an incentive when playing this game. And the elite royal pass is definitely worth the splurge, as you can complete quite a few more missions and gain a lot of great items in the process. I first heard about this game through my boyfriend Sumit, who has been playing since the game started last year. Tonight, I decided to play duos with my friend Billy, who I have known for over 10 years. He's always been a gamer and streamer, so it is always fun playing with him because he is a safe yet destructive player that can kill and camp according. With that said, I just achieved my first "chicken dinner" (which is basically what you receive when you win the game) with Billy in a duo match on the Erangel map in classic mode. I killed a total of 5 players in addition to the final player (luisdonal94) to receive the big win at the end. I received a total of 720 BP for my win. With 708 in experience, I had a kill rating of +74 and a survival rating of +59 for a total rating tonight of +73 which isn't that bad. I was also able to achieve both the "chicken master" and "medic" titles. This mobile game is literally too fun. And although I win some, I also lose sometimes too. Most of the time; however, I find myself in the top 10. I tend to join squad matches most, but I love to play duo and solo from time to time also. With that said, if you haven't played PUBG, you truly need to. So, tonight when playing PUBG on my iPhone, I found myself being on the only surviving player for my entire team. As two of the players died early on, one of lasted quite a while before they also died. It is quite hard to play solo in a squad match, as most teams tend to stick together and the chances of you getting ambushed by 3-4 people is relatively high. Tonight, I took one for the entire team and brought home the chicken dinner in my quest, when playing the Erangel map. With the last remaining player being Lork, I was able to shoot them by simply running directly at them and just shooting, as they attempted to shoot at me. I killed a total of five players in this particular PUBG game. 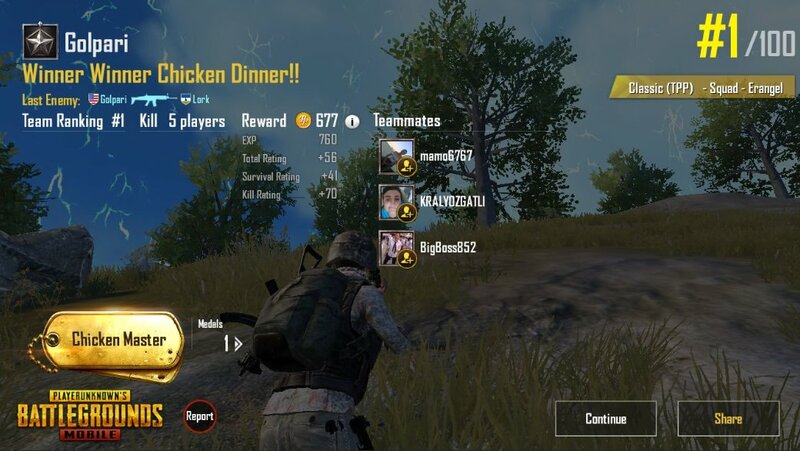 For winning the chicken dinner for my squad, I was able to garner a total of 677 BP. I also gained 760 in experience. My total kill rating was +70 and my survival rating was +40 with a total rating of +56. 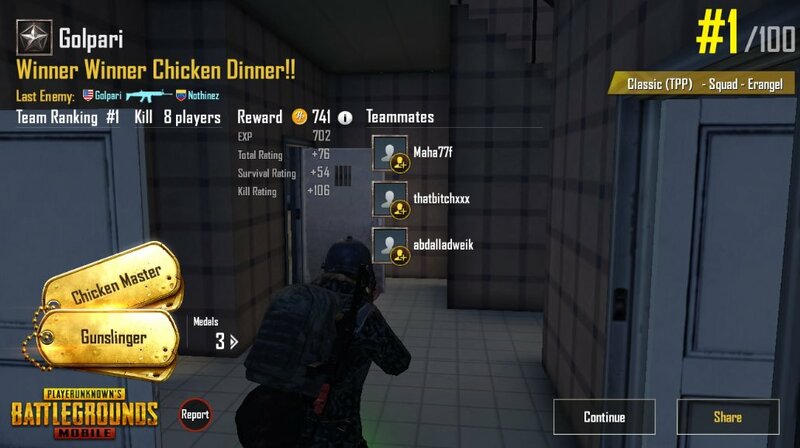 In addition, I achieved the chicken master title for shooting the final player in the game, winning for my entire squad. As my squad for this evening consisted of mamo6767, KRALYOZGATLI and BigBoss852, it was fun playing with them. KRALYOZGATLI killed more players than me and withstood for quite sometime before he was killed. Regardless of winning or losing, I always have a fun time. I started playing PUBG earlier than expected today, as I wanted to take a break from the kitchen to play. It is Christmas day after all and I spent most of the early morning cooking in the kitchen. My boyfriend Sumit introduced me to this game earlier this year and I have been hooked on it since. I don't know what it is, but I feel like I kill more people when I play solo versus in a squad, but luckily was able to garner 8 kills today in addition to the famous chicken dinner against player/user Nothinez, in spite of my entire squad dying early on. My total reward for this game was 741 BP. I received 702 in experience with a kill rating of +106 and a survival rating of +54. My total rating for today's play was +76, which is ok for playing with a squad on the Erangel map. Today's squad consisted of Maha77f, thatbitchxxx and abdalladweik. I was also able to get the titles "Gunslinger" and of course "Chicken Master". I was also MVP for this match too. And like every match, it is always a great time playing PUBG, no matter win or lose. Today, I took the liberty of playing PUBG in a Solo match. With four maps to choose from, I decided to play Miramar, as I was looking to go straight down the list and play all four maps, back to back. I played Erangel several minutes before this map. I killed almost 20 people (which is a record for me) and ended up dying in the playzone running towards the circle. Well, just now I can admit that I am very happy to have won my very first Solo match on PUBG. In total, I received a total of 684 BP. I also gained 830 in experience. With a kill rating of +105 and a survival rating of +55, my total rating for this match was +75. 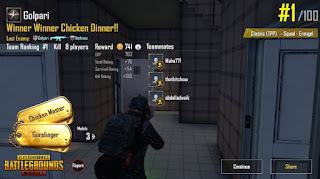 I killed 8 players in this game total, including the final player bbk to garner the win and get the famous chicken dinner. I also received the Berserker, Gunslinger and Terminator titles. On another note, several months ago, I downloaded the actual app for this game as my boyfriend Sumit plays, but had issues with it so I just deleted it without flinching. I never played a match at all and only entered the training room several times. Just recently, I re-downloaded the app and decided to play. Although I was horrible the first few matches, I've become really good with time and experience playing. You win some, you lose some, but in the end it is so fun. Tonight, I found myself really wanting to play the Lightening Round on Words with Friends. It is basically a modern version of Boggle meets Scrabble, except you play on two designated teams - the purple team and the blue team. 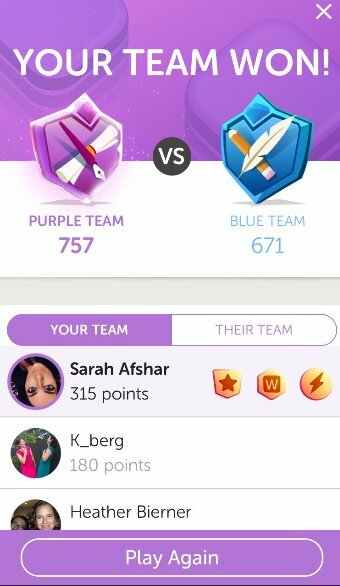 You have to basically have to come up with great words and whichever team reaches 750 (or more) points first, wins the match. I am feeling a little under the weather, as my boyfriend is also sick. We have the cold/cough thing that is going around. We both were talking and I found myself playing this app a lot while talking to him and actually winning virtually every single match I played. I am not sure why I play better when I am not feeling good. Perhaps this kind of escapism allows me to forget how horrible I am feeling. I ended up achieving the top reward for the most words, for words with the most points and for the longest point word. In this particular match, I garnered 315 points, making me the top player of this game and winning for the purple team. Currently, there are no prizes. You don't really win any incentives for playing, but it is so much fun and if you love word games, you will love this one. I do believe I heard something about them holding contests, but there is no proof of this. I am also hearing rumors about Words with Friends Live, which is allegedly the platform they will be holding these contests; however, this is hearsay at this point.